become a strong follower of Jesus through Mary. This week we celebrate two Marian feasts. Today we recall how before her birth Mary was readied to become the Mother of God. Friday we will celebrate Our Lady of Guadalupe, Patroness of the Americas. Mary’s 1531 apparition to the Indian convert Juan Diego has particular relevance for today since at the time Mexico — New Spain– was experiencing ethnic, racial and class tensions. On his third trip to a skeptical bishop, Juan Diego brought with him a sign Mary provided — a cloak filled with out of season roses. 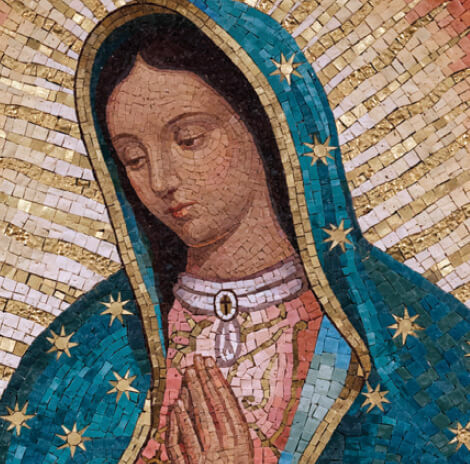 To the astonishment of both men, the opened cloak revealed not roses but Mary’s image as she had appeared, resembling an Aztec princess, standing on a half moon. Still vivid on Juan Diego’s tilma, the image has been object of devotion and scientific studies which have revealed the imprint of at least thirteen people in Mary’s eyes. The microscopic images include the bishop, Juan Diego, a slave, a family– a microcosm .of God’s graced multi-cultured people. Let us look through our mother’s eyes and see that our God Emmanuel is still with us, calling us to unity and love. Order Coffee With Mary Today! Can you imagine what it would be like to actually sit at a table and have a cup of coffee or a cup of tea with the Blessed Mother? What feelings would you share with her? How would she respond to you and your shared feelings? What questions would you ask her? In our book, “Coffee With Mary”, you will almost feel and see the Blessed Mother sitting across the table from you sharing her story and helping you cope with the daily problems of life that each of us face.